Hire the top 3% of freelance C++ developers. Toptal is a marketplace for top C++ developers, engineers, programmers, coders, architects, and consultants. Top companies and start-ups choose Toptal C++ freelancers for their mission-critical software projects. C++ is a powerful general purpose multi-paradigm programming language. The language's immense set of features, its overall complexity, lack of elegant external tooling that other popular languages have, and access to low-level resources makes this one of the most difficult programming languages to master. Taming this mammoth beast requires much experience and wisdom. Toptal is a marketplace for top C++ developers, engineers, programmers, coders, architects, and consultants. Top companies and start-ups choose Toptal freelancers for their mission-critical software projects. Sam is a senior freelance developer and architect with over 20 years of experience developing in the financial industry. Sasa is a top architect/developer with a background in desktop, embedded systems, servers, and industrial solutions. He loves challenges, and if there is a hard or seemingly impossible project, he just might like it. He enjoys working on signal processing, image processing, number crunching, compression, protocols, machine vision, compilers/parsers, and algorithms in general. Antonio is an experienced, self-motivated, results-driven, flexible freelance professional who specializes in turning business ideas into software solutions. He covers the entire software development life cycle, from concept to final product, using the best technologies. Dmitrii is a Software Engineer with a strong background in the development, design, and maintenance of new and existing software. He has extensive experience programming across multiple platforms, writing C and C++ code for over two decades. C++ is a powerful general purpose multi-paradigm programming language. It powers some of the most performance intensive applications, and serves well to satisfy some particular niches, including but not limited to desktop applications, embedded applications, device drivers, game engines, and more. The language’s immense set of features, its overall complexity, lack of elegant external tooling that other popular languages have, and access to low-level resources makes this one of the most difficult programming languages to master. Taming this mammoth beast requires much experience and wisdom. This hiring guide will help you identify C++ developers who not only know the basics, but also understand its relevant concepts in-depth and know their way around the various challenges and pitfalls of this powerful programming language. Questions like the following are meant to figure out how familiar the candidate is with C++, and to see if they know all the quirks and nuances of the language. Explain what, if anything, is wrong with it? How can you improve this code or work around any issue in it? The switch statement, in C++, only accepts types that are integral, enumerated or class which has a single conversion function to an integral or enumerated type. std::string in C++ is not a primitive type. In C/C++, switch statements are typically implemented as branch tables. Generating them for integers, integer-like or enumerated types is easy, which is not the case for strings. In case ext is expected to hold unknown values, you might want to use m.find(ext) != m.end() to determine if the key actually exists first. This is because the  operator will automatically increase the container’s size everytime a non-existence key is used. Q: How do you implement a variadic function in C++? For example, the following function will accept an argument, n, followed by any number of additional arguments. However, starting C++11, Variadic templates can be used to achieve similar results, as they are type safe and do not perform automatic type conversions. Q: What are the different ways of passing parameters in a function call? Explain how they are different. Pass by value: this causes the parameter’s value to be copied. Typically used for primitive types where the overhead of copying the value is minimal. In newer standards, such as C++11, with move semantics even complex objects may be efficiently passed by value. Pass by reference: this causes the parameter inside the function to alias the variable passed when the function is called. Parameters can also be passed by const reference. This is very similar to what pass by value does, except the underlying object is not copied. Additionally, pass by pointer can be considered another way of passing parameters. Although not the most recommended way of passing parameters, this works by passing the memory location of a variable by value, allowing the function to access the original variable’s contents, as if by reference. Typically used when it is important to pass NULL as the parameter. However, recommended ways of dealing with optional parameters involve the use of external libraries. We start by declaring an array of 2 ints. We are then taking a pointer to the first element in x. Next, we are updating the value pointed at by x to 2. Finally, we are Incrementing the pointer to move to the 2nd element and updating the value pointed at by x now to 4. Q: How are exceptions handled in C++? Here, 42 is the parameter which will be passed to the handler as the only argument. Within a catch block, this parameter can be omitted to rethrow the current exception. In a try-catch block, multiple exception handlers can be specified using multiple catch blocks. The type specified for the catch block will determine if it will be used to handle a particular exception. Even though C++ is closer to the metal than most other popular programming languages, there is still a lot going on under the hood. A great C++ developers is very likely to have gained this knowledge, sometimes out of sheer curiosity and sometimes the hard way. Why is the delete statement necessary for variable arr1, but not for arr2? How can this be re-written using smart pointers? Memory allocated dynamically using new or new must be deallocated to reclaim the used memory. This is because C++ doesn’t have a garbage collector to deallocate those resources automatically. The delete operator works on an array of objects that destroys each element before marking the memory as reusable on the heap. This will automatically destroy and deallocate the array as soon as the smart pointer object goes out of scope. Q: What is stack unwinding? What are its implications on object storage? Stack unwinding happens when an exception is thrown. This is when function entries are removed from the stack up until an exception handler is found. In C++, stack unwinding will also cause stack variables to be destroyed automatically. Here, if panic is true, an exception will be thrown causing the program to never reach the delete statement and thus preventing the SomeClass instance to be deallocated from the heap. Q: What is a function-try-block? What are these ideally used for? A function-try-block allows you to attach a sequence of exception handlers after the function body that effectively treats the entire function body as a try block. This way, any exception that occurs with the function body may be handled by one of the catch blocks following it. Ideally this syntax is used to log exceptions rather than handling them. Sometimes these are also used to modify the exception and rethrow them. Q: What are templates? In terms of function declarations, how is this different from function overloading? … will allow a developer to use the function add with any type that supports the + operator. Templates allow classes, functions, etc. to be declared in a type “independent” way as long as the behavior remains the same. The compiler automatically generates the necessary code for every instance of the templated function or class used. When it comes to functions, unlike function templates, function overloading requires you to explicitly define the behavior of each instance of the function. Q: What are special member functions in C++? Briefly explain their use and state their defaults when not explicitly defined. The default constructor, destructor, copy constructor and copy assignment (along with move constructor and assignment as introduced in C++11) are the special member functions in C++. The default constructor is called when objects of a class are instantiated without passing any arguments. When no constructors are defined for a class, the default constructor is automatically defined as a function that is no-op. The destructor, meant to serve as the opposite of constructors, allows an object to clean after itself before it is deallocated from memory. When not defined, similar to the default constructor, a no-op function is automatically declared on the class. The copy constructor is essentially a constructor that accepts an argument of its own type by const reference. This constructor is meant to create a clone of the object being passed. When not defined, a default that copies all the members of the object is defined if and only if no move constructor or assignment function is defined. The copy assignment function is called when an object is being assigned to another variable of the same type that is already initialized. Automatic default declaration follows the same rule as copy constructor as stated above. Move constructor and assignment functions are similar to copy constructor and assignment functions, except that these are called when the values of the source object are no longer necessary and may be taken over by the destination object. The default behavior moves all members, but is automatically declared only when no copy constructor, assignment function, or move assignment function is declared. Q: Does C++ allow multiple inheritance? 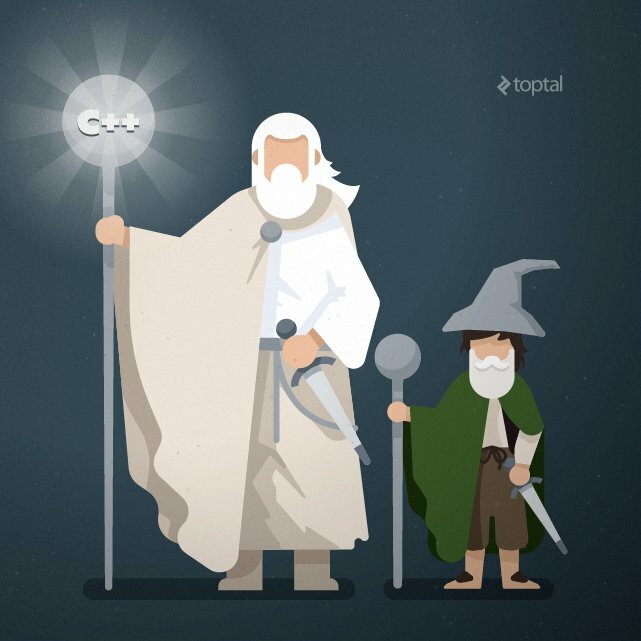 What are some pitfalls of multiple inheritance and how can you work around them in C++? The questions outlined in this guide cover some basic and some tricky aspects of C++. But just like its possibilities, the language’s hidden surprises are limitless, and that makes it difficult to cover everything about C++ in interviews. Therefore it is essential to evaluate a candidate’s competency and deep understanding of C++ through their ability to convey their ideas clearly and vividly. We hope these questions will help you as a guide in your search for a true C++ expert. These rare elites may be hard to come by, but they will clearly stand out from the rest of the pack. See also: Toptal’s growing, community-driven list of essential C++ interview questions.